Well we won’t make that mistake again; we’ll make a different mistake. Some readers wrote to say they were confused by our advice on the use of DOS as a quick and easy way to control PC computers. Most readers were not confused, but those who got lost were confused because while DOS, the operating system underlying Windows, is easy to use, it is super strict about grammar. Yet it’s common to type an extra space or key. All this reminds us of one of C. Northcote Parkinson’s famous “Laws.” That is the one that states: No matter how many times you search for a mistake in your work, the first person to look over your shoulder will see it immediately. His most famous law is that all work expands to occupy the time allotted to its completion. A corollary to that law is that anything left until the last minute will be done in one minute. So things do sometimes get out of hand and we got a lot of very pleasant reader mail about our attempt to simplify computer control. One fellow wrote to say he used to program in “Assembly” language, but retired and switched to painting. (He’s pretty good: Take a look at blackwoodart.com.) Then he got a dog, a beagle, and slacked off on the painting. Assembly is what’s called a “low level language.” Not because it’s low class but because it’s very close (nearly one to one) to the instructions the brain chip actually understands. High level languages, like BASIC or C++, are so-called because they are far removed from chip talk. But we digress, as they say, and must move on. Showing off photos on your iPad is fun. But getting them there can be a hassle. We use the “iPlugMate,” a $35 gadget we found on Amazon. 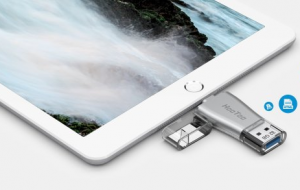 The iPlugMate, from “HooToo,” is a tiny flash drive with two working ends. On one end is a “Lightning Connector” which plugs into an iPad, Macbook, iPod or iPhone. The other end is a USB 3 connector which plugs into a Windows computer. Plug it into your computer to get the photos you want on the flash drive. Then plug the flash drive into your Apple device to transfer them, using a free app. It also works in the other direction. We tried it with an iPad, a couple of Windows XP machines and a Windows 10 machine and in every case it worked great. Huge photo folders transferred quickly over to the tablet and we of course kept the original photos on the drive as a backup. Another way to transfer photos is Apple’s free iCloud service. Unfortunately, iCloud doesn’t work with Windows XP, unless you use a techie workaround that was too techie for us. ICloud sers get five gigabytes of storage space, but you have to choose a folder you want to keep synchronized. If you have lots of photos in separate folders, drag them all into the iCloud folder and they’ll stay in sync. MakeaGif.com, a free site, lets you make animations from still photos. If the photos aren’t similar, it will look more like a slideshow than an action shot. The nice thing about the GIF file format is that it loads much faster than a video. So if you put it on Facebook, your friends won’t turn to stone waiting for it. After adding your photos and clicking to turn them into a GIF, you can add photo captions if you like. Or download it. Or click to get a link and share it in an email or on Facebook and other sites. The “Razer Ornata Chroma” is a $99 keyboard for gamers and it’s pretty fancy. We fell in love with the backlit keys, which cycle through all colors of the rainbow. Joy is using it as her regular keyboard now. This lighting is nice to have when you stumble into the office at night. It’s also good in the daytime if your office is a bit dark. You can customize the colors and display to get various effects. Tap the “fire” effect and the keys appear to be smoldering. The key strokes are short and spring loaded. This reduces the time between striking and having your actions register, crucial when you’re in a high-speed game. You can give it ten commands at once and its own memory keeps track. You can assign keys to specific functions for quick and sure action. These shortcuts, called “macros” have been around since the earliest days. When Bob was a reporter for the Philadelphia Inquirer, the copy desk editors had a shortcut key for “Zbigniew Brzezinski,” Jimmy Carter’s national security adviser. Tap a key and Zbigniew was slugged in. What we have found interesting about this sort of thing over the years is that equipment made for video game players — who always want fast action and lots of options, is often the best of its type (so to speak). A reader begged to differ on our password advice. We warned against the free version of “LastPass,” because it’s had a couple of security breaches. To recap the main feature of Lastpass, it saves the effort of writing down dozens of passwords, which in many instances must be changed on a regular basis. You only need to remember one master password, which is not recorded by LastPass. Knowing it unlocks all the others. At least that’s the theory; for some reason, it failed to log us in on half the accounts we have passwords for.